In May of 2014 I found this website and was quite intrigued. I have always thought of myself, spiritual, not religious, when in fact it turns out, I can't really buy any of the God theories. I find it hard to wrap my head around the belief that this old guy sits up in the sky and dictates everything we do down here on earth as if he's some great puppet master. Religious people often confuse me. Most of them claim they live by the word of Jesus Christ when in fact, they pretty much do and say the exact opposite of what he taught his followers. Love thy neighbor, isn't that what they say, yet more of them vehemently believe in the death penalty and viciously hate gay people. How is that loving thy neighbor? 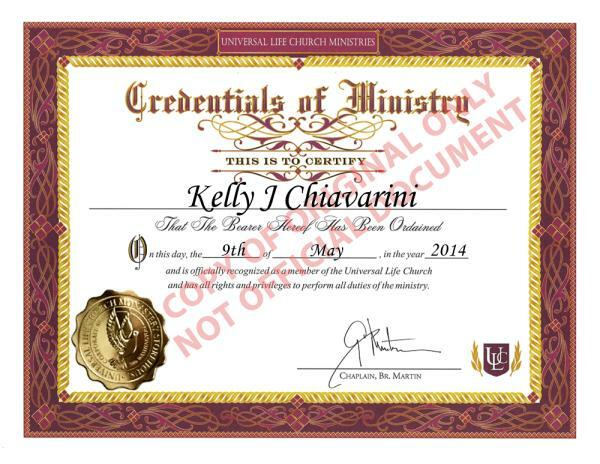 I digress, so back in May of 2014 I come across this site Universal Life Church and found out that you can really become an ordained minister. I thought it a joke at first but then my I figured what the heck? Even though I do consider myself an Atheist, I still have a moral code and beliefs that people should treat each other with at least a little empathy, compassion and some decency. It wasn't long after I let people know that I got hired (well it was a favor to a friend) to perform my first wedding ceremony! It was actually really nice.